Sarah why you decided to focus on the Pinjarra Orogen in your thesis? My honours thesis at Curtin University focuses on investigating the geochronological framework and crustal evolution of the Pinjarra Orogen, which is an orogenic belt found in Western Australia. More than a billion years old, the Pinjarra Orogen is one of the least understood orogens in mainland Australia. By combining igneous and metamorphic petrology, plate tectonics and geochronology, my thesis attempts to better constrain and piece together the evolution of such an important and unappreciated orogenic belt in Australia. I decided to focus on the Pinjarra Orogen because its paleogeographic location is key to better understanding reconstructions of the supercontinents Rodinia and Gondwana, containing evidence of both Grenvillian (1300-900 Ma) and Pan-African (700-500 Ma) tectonism. These orogenies record the rifting and assembly of global supercontinents, making the research I’m doing fascinating and meaningful and combining so many aspects of geology which appeals to a wide range of researchers. What about it this orogen really excites you? Over a period of 600 million years the Pinjarra Orogen experienced multiple phases of deformation, magmatism and high-grade metamorphism, subjecting rocks tens of kilometres underground to temperatures of up to 850oC. These kinds of pressure-temperature conditions modified the original rock, producing large, unique minerals such as garnet (red), cordierite (blue) and sillimanite (silver). These rocks are commonly known as metamorphic rocks, meaning to change, and form almost exclusively beneath the Earth’s surface at sometimes extreme temperatures and pressures. Often these rocks are uplifted to the surface so quickly that the rock doesn’t have time to adjust to the new conditions, freezing the mineralogical, textural and chemical composition of the rock. This allows scientists to observe natural processes which occur deep within the Earth, as a snapshot from a rock at the surface. The metamorphic rocks of the Pinjarra Orogen offer intriguing snapshots from billions of years ago, which is one of many reasons why I chose this honours project, other than having the opportunity to examine fascinating metamorphic rocks with garnets and other colourful minerals! Although we’ve collected a range of data for the project, one of the biggest challenges has been attempting to understand what the data means in terms of global tectonic processes. Many different aspects of the Pinjarra Orogen is still under debate, and so interpreting the results has been a definite challenge. Furthermore, although my project area is well-exposed and easily accessible, some key geologic boundaries between different rock units could undoubtedly provide answers to some of the remaining questions my project poses. However, the exposure of these key boundaries is greatly limited and are currently concealed by million-year-old Cenozoic sediments known as the Tamala Limestone, providing further challenges to deal with. Can you tell us what you have discovered from your research? My honours project presents zircon U–Pb data and trace element geochemistry in conjunction with zircon Lu–Hf isotope data from the Leeuwin Complex, to better constrain the geochronological framework and crustal evolution of various Pinjarra Orogen components. Unfortunately, I can’t divulge any specific results we’ve acquired due to confidentiality restrictions, but my supervisors and I are hoping to have the results published in a scientific article very soon! What is the most rewarding part of your study? One of the most rewarding components of academic research is not only the freedom given to formulate your own research project, but the ability to answer questions you formulated at the start of the project. Often your results will leave you with a dozen more questions than you began with. But the ability to make a discovery, even if modest, is an incredible experience, knowing that one has contributed towards uncovering a piece of the puzzle. What are the most exciting experiences you have had in the field? Studying geology at Curtin University has taken me to some beautiful parts of Australia, from exploring the glorious coastline of Western Australia in Albany, Margaret River, Kalbarri and Shark Bay, to more inland adventures to Kalgoorlie, Carnarvon and South Australia. 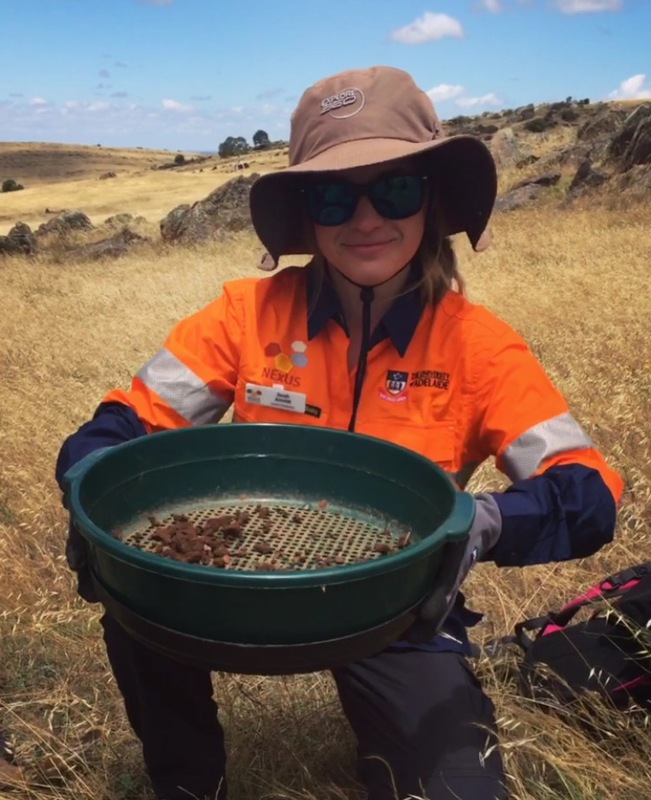 Some might think that pitching a tent in the dark, camping in below-freezing conditions, hiking for tens of kilometres a day or even sleeping in an abandoned sheep shed for two weeks would put students off fieldwork, but it’s entirely the opposite. Fieldwork allows students to step out of their comfort zone and challenges them to think outside of the box. Some of the most exciting experiences in the field for me has been travelling and hiking through some of Australia’s uncharted landscapes, sleeping under the stars each night, living a simple life amongst the flora and fauna of Australia, snorkelling in heritage-listed areas and having the opportunity to bond with fellow colleagues. My small cohort is like family to me and these fieldtrips give us all a chance to bond and spend extended periods of time together in outlandish scenarios. Many other courses at university never experience the same degree of social interaction. How do you juggle study and work? Two of the main ways I’ve found to successfully juggle study and work is time-management and communication. From the start of the year students had to produce a research program/time schedule for the entire year depicting allocations for field work, acquiring data and write-up, research, employment, etc. It’s one thing to complete a research program, but another to have followed the schedule and finished tasks in time. Communication is also vital as your time schedule is not the highest priority for supervisors at work or university. Everyone has other things going on within their lives and it’s so important to keep in touch and maintain correspondence in order to reach your deadlines and keep on top of your workload. I’m currently putting the final touches onto my final thesis and preparing a presentation for a Geological Society of Australia conference later this year. After the conference I’ll be travelling back to Perth to present my thesis to the geology department, and then it’s off to South Australia for three weeks for an advanced mineral exploration program run by the National Exploration Undercover School (NExUS). Exciting times, what piece of advice would you give to other students studying geology? My biggest piece of advice for any geology or geoscience student is to make the most of opportunities given to you and to actively seek them out whilst studying. There are so many different forms of support, whether it be through mentor programs, industry meet-ups, scholarships, bursaries, vacation work or simply joining a society, which can leave you in such a better position when you graduate and enter the workforce. Vacation experience is now generally regarded as a prerequisite to graduate employment and very competitive to get into, so get started early to improve your resume, a LinkedIn profile and other social media forums to put your name out there and enhance your network. It is also important to remember that you can never have too much training. Any time there is an opportunity to learn a new skill, software, procure a special license or even advance your safety training, take it. All the added experience and contacts you have will set you out from your peers and give you a head start in the industry. Stay proactive, learn as much as you can and simply enjoy yourself. What do you think about the Gold Industry Group's role? I commend the involvement of the Gold Industry Group in Western Australia promoting the gold sector through community involvement and education. Being directly involved in the influential #heartofgold Discovery Trail in Elizabeth Quay in October 2017, I witnessed firsthand the enthusiastic response of the community in discovering how important the minerals industry is in Australia’s past, present and future. The Gold Industry Group employs a wide range of forefront techniques to promote the gold sector, engaging people of all ages through member events, conferences, virtual trails, and more! I’m so excited to continue my involvement with the Gold Industry Group to ensure a proactive and united voice for the gold industry, which is supported by an educated and supportive community. What do you do when you are not studying or working? When I’m not studying or working I love to keep in shape at the gym or hiking in the hills area. There’s so many unique trails, national parks and quarries on our doorstep offering a vast range of engaging activities when I need a break from studying. Video games, books and tv shows are other pastimes which allow an escape during stressful and busy schedules!